Clarksville, TN – Max Thurmond joins the Austin Peay State University football coaching staff under first-year head coach Will Healy as the special teams coordinator and linebackers coach. Late of West Alabama, Thurmond spent the past two seasons in a similar position for the Tigers. During his stint in Livingston, Thurmond saw three players earn All-Gulf South Conference first-team honors and three earned second-team distinction. Under Thurmond’s tutelage, return specialist Tyreek Hill (AFCA, D2Football.com) and linebackers Quentin Harton and Brandon Keel (USA College Football) earned All-American recognition in 2015. Prior to his time with the Tigers, Thurmond coached for 11 seasons at Jacksonville State (2001-12), beginning as a student assistant and spent much of his tenure working with the outside linebackers, cornerbacks and punt return team before ending his JSU career as wide receivers coach and special teams coordinator. Thurmond’s tenure in Jacksonville saw the Gamecocks transition to the Ohio Valley Conference from the Southland Conference. 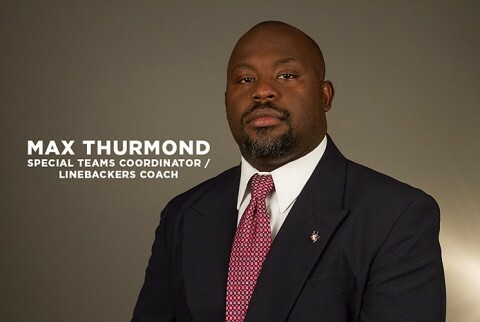 Thurmond was a staffer for the 2003 and 2004 Gamecock squads that led the OVC in rushing defense, including the 2004 squad that was 10th in the nation, and led the league in turnover margin for three consecutive seasons. Thurmond was on staff for three OVC Championships (2003-04, 2011) and playoff appearances in 2003-04 and 2010. With Thurmond as outside linebackers coach in 2009, the Gamecocks led the OVC scoring defense, total defense, pass defense and pass efficiency defense. Between his time at Jacksonville State and his stint at West Alabama, Thurmond coached one season at Reinhardt (Georgia). Thurmond graduated from Jacksonville State in 2001 with a degree in exercise science. During his playing career (1996-2000) with the Gamecocks, Thurmond recorded 63 total tackles as a cornerback. Thurmond and his wife Gresha have two children, Maxwell Jr. and Asha.